Equities Rising On "Rivers Of Blood"
“Libya is at a crossroads. If we do not agree today on reforms …. rivers of blood will run through Libya. We will take up arms… we will fight to the last bullet. We will destroy seditious elements. If everybody is armed, it is civil war, we will kill each other. The picture below is not Moamer Kadhafi (he wishes he still looked that good) or Saif – it’s Vigo the Carpathian, who also promised “rivers of blood” but only actually managed to produce rivers of slime before the Ghostbusters put him back in the painting. Did Kadhafi steal his speech from the 1989 Ivan Reitman film or, perhaps, did he lift it from arch-conservative Enoch Powell’s speech? Powell warned that if the UK were to allow immigrants to have ordinary rights, that the streets of London would look like the set of Ghostbusters (I am paraphrasing slightly). While the foundation Powell laid in England became the rallying cry for Conservatives in Arizona recently, when we see OTHER countries oppressing the rights of people we go nuts, right? About 250 protesters have already been killed by Kadhafi’s storm troopers but we’re not worried about the rivers of blood – we’re worried about the rivers of oil that are controlled by Libya, which pumps 2Mb a day out of their estimated 42Bn barrel reserves. 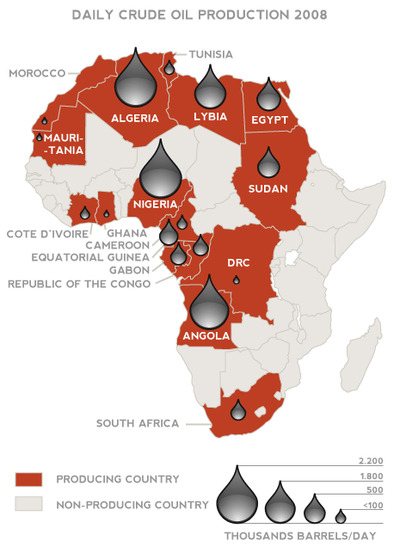 Libya, boarders Egypt,Tunisia and Algeria – 3 more of the biggest African oil producers and all with rioting citizens who are offended that they are beginning to starve while the top 1% of their country continue to live lives of wealth and splendor. What the people do not realise is that, even if their leaders wanted to help them – they really can’t. The inflation that Ben Bernanke is shoving down the throats of the World (in place of food) is more than any government that can’t print money can handle. Take poor Hosni Mubarack, for example. It is reported he stole $70Bn from the Egyptian people over 30 years – that’s $2.3Bn per year or what Lloyd Blankfein would call “Mid-year bonuses” but, rather than getting invited to the White House to set economic policy, poor Mubarack is shown the door by his people. Even if Mubarack wanted to stay in power and even if he wanted to give back all $70Bn to Egypt’s 80 Million people, that would only work out to $875 per person or 13% of their $6,347 per capita GDP. That does not really help much when food inflation is running close to 40% – does it? That would make it irrational for Hosni to do anything but take the money and run because what’s broken in Egypt can’t be fixed – even if he wanted to. Libya is in the same predicament, as is Sudan, Algeria, Nigeria, Angola… What happens when people are starving while they see their leaders living lives of luxury? They get pissed! They demand CHANGE. So Global leaders have the choice of step down or fix the problem. There are really only two choices available to leaders who want to stay in power and address the situation where there is less money for food than there are citizens and that is A) Increase the amount of money the citizens have to buy food or B) Decrease the amount of citizens. When A is impossible (we can’t even do it in this country) then why do we vilify Kadhafi for choosing B? This is what we’ve been saying the Fed’s policies would lead up to so, please, let’s not pretend to be all shocked and disgusted that one of Bernanke’s lab rats finally reacts to the stimulus as his survival instinct kicks in. John Boehner gave his own “river of blood” speech this weekend – saying “If some of those jobs (created by the Obama Administration) are lost in this – SO BE IT! We’re broke – it’s time for us to get serious about how we’re spending this nation’s money.” Plan B wins again! Republicans have even submitted a draconian budget that would make deep cuts into the tiny vein that is non-security discretionary spending, cuts that would prove devastating to the poor and working class. At the very time that many Americans — and the very country itself — are struggling to emerge from a very deep hole, the Republican proposal would simply throw the dirt in on top of us. This cannot be. Financing for education and social services isn’t simply about handouts to the hardscrabble, it is about building an infrastructure that can produce healthy, engaged and well-educated citizens who can compete in an increasingly cutthroat global economy. One of President Obama’s new catchphrases is “win the future,” but we can’t win the future by ceding the present and romanticizing the past. One thing America does excel at producing though, is prisoners! 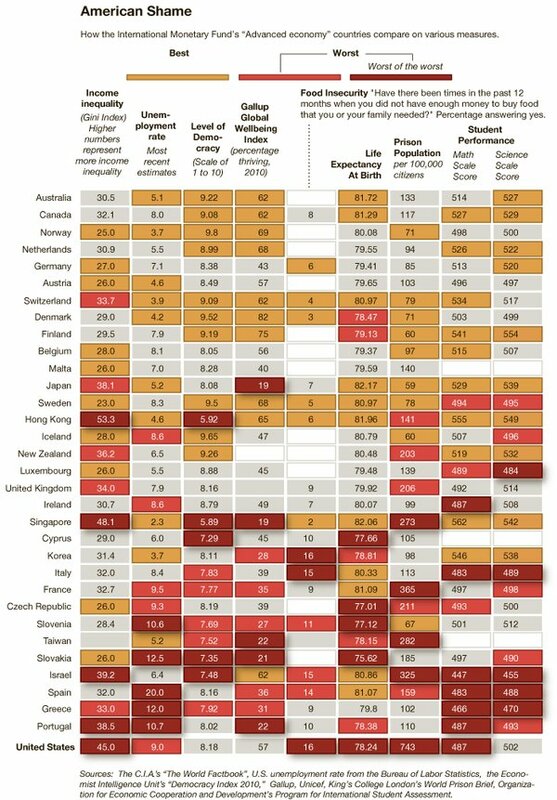 This country already creates more prisoners per capita than any two other countries on that list and, without France and their recidivist ways (still half of ours), we would be bigger than the next three on the list! Why does America have 7.2M citizens in prison or on probation while China, with 1Bn more citizens than we have, has only 1.5M? India has just 313,000 prisoners in a nation of 1.1Bn and Pakistan (population 169M) has just 87,000 inmates? In case you think it’s “an Asian thing,” consider that Germany (81M) has 75,000 prisoners, England (61M) has 78,000 prisoners and the Netherlands, where drugs are legal, have one of the lowest rates of incarceration, with just 16,930 of their 16,531,294 citizens in jail. For a “freedom-loving” people, we sure do seem to lock a lot of people up, don’t we? Fortunately, prisoners are not included in American Quality of Life surveys and they are not considered unemployed. In fact, we kind of employ them in the $37Bn US prison industry – and that’s not counting hundreds of Billions of Dollars spent each year in the legal system by citizens who are trying to stay out of jail facing off against the hundreds of Billions of Dollars the state spends to try to put them there. Aside from deciding who goes to jail and who doesn’t becoming one of our nation’s biggest “free” enterprises, prison labour itself is a huge business as all sorts of jobs are done by prisoners, who earn about 50 cents an hour for their labour. Who says we can’t compete with Vietnam? The Pew centre’s findings in March 2009 report that 1 in every 31 adults in America is under some form of correctional control (about 32 per 1000). Bureau of Justice statistics in their “Key Facts at a Glance” of correctional populations, estimates the total number of all persons on probation, parole, in prison and jail in 2008 to be at 7,308,200, or about 20 per 1000. By contrast, in 1980 when the Drug War was starting to get off the ground, the same figure was 1,842,100, or about 6 per 1000 – the same as most “civilized” countries. For comparison, at the height of slavery in America there were less than 4M slaves. With over 5M additional Americans “just saying no” to freedom since Nixon first declared a “War on Drugs” in 1971 to keep those dollars flowing at the same time our War on (whatever it was we were supposed to be doing in Vietnam) was winding down – it’s a little surprising that the $15Bn a year we spend keeping our citizens in jail and the who the Hell knows how much we spent arresting 1.7M people on drug charges last year (as well as the court costs) – is not even a topic of discussion in the budget talks. Nearly three out of four clients are women — many of whom are struggling to keep their children safe and their families together. Overall, the clients are the most vulnerable among us and are as diverse as our nation, encompassing all races, ethnic groups and ages, including the working poor, veterans, homeowners and renters facing foreclosure or evictions, families with children, farmers, people with disabilities, victims of domestic violence, the elderly and victims of natural disasters. Isn’t it funny how the story always comes the Sheriff of Nottingham (Boehner) vowing that he will protect the people by stopping that awful Robin Hood (the budgeted agencies) who dare oppose his will by attempting to bring justice to the oppressed and redistribute the wealth of the top 1%? What else is falling under the Republican axe? Manufacturing Extension Partnership (MEP) Program delivers a high return on investment to taxpayers. No other program provides as much bang for the buck. For every one dollar of federal investment, the MEP generates $32 in new sales growth. This translates into $3.6 billion in new sales annually. For every $1,570 of federal investment, MEP creates or retains one manufacturing job. – $125M cut (80,000 jobs). Last year, my 2010 outlook predicted “A Tale of Two Economies” and there was no point in changing that outlook for 2011 because, clearly, we are just getting more of the same as the polarization of rich vs. poor becomes even more extreme. I did believe, in December of 2009, that the Democratic Party would recover from their slow start and get on with doing that which they were elected to do – which was balance the budget by repealing tax cuts we can’t afford and investing in Infrastructure, R&D and Education which would put this country back on the road to prosperity. Boy was I wrong about that! Instead we got the clearest indication since Boss Tweed that the Democrats are every bit as much a tool of Big Business interests as the Republicans. US citizens are now being ground into poverty and repressed to such a level that ONLY Singapore and Hong Kong have a greater wealth disparity than the United States – AND THE PROGRAMS THAT ATTEMPT TO REDRESS THIS ISSUE ARE THE ONES THEY WANT TO CUT! 43% of the people in our country are not “thriving” – which means they do not have enough money to meet their basic needs of food, clothing and shelter without going further into debt. 9% of our people are “officially” unemployed but, if we counted our unemployed the way Spain does, we would have the same World-leading 20% level that Spain does. We are THE WORST country in the World – tied with Korea in the level of “food insecurity,” with 16% of the people in this country not having had enough money to buy food in the past 12 months. Don’t forget – we’re not even counting the prisoners! So do not fool yourself into thinking “it can’t happen here.” That goes for my European Readers as well – as Angela Merkel’s party found out this weekend in their crushing defeat. We will be exploring some additional highly leveraged Disaster Hedges today in Member Chat (we already have two key hedges and our $25,000 Portfolio is STILL bearish as it’s short-term. As I noted in the weekend post, which charted and reviewed our current situation and as summarized excellently in Stock World Weekly, which also gives us a nice Global perspective on the markets – it’s a very unstable situation and, as I said to Members over the weekend in Chat as we discussed the issues in greater detail – even China is now having protests – it doesn’t make sense not to hedge our risks of staying in the markets at this point. If 2011 is still a tale of two economies – we’d better play for both of them. I’ll give the final word to the great Glenn Beck, who explains how the United States can completely fall apart in just 15 days – enjoy!